Difference of 55 yards!!! 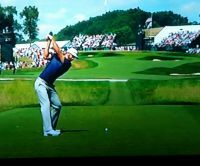 That is the average distance that Dustin Johnson outdrove runner-up finisher, Jim Furyk, for four rounds in the US Open. He also was almost 20 yards longer then the next longest driver! In my predictions, I stated that Oakmont wasn't a course that suited his game. I based that on the need for accuracy off the tee and the difficulty of the greens. His nearly unbelievable driving display won this championship. He was able to hit short wedges into holes where others were hitting long irons. This was a well-deserved win by one of the most talented golfers in history, but controversy and bad breaks always seems to surround him in major championships. There was an unneeded rules controversy during the last round, but this time he overcame the distraction and stands as a survivor with golf's biggest prize. The USGA prides itself on setting up a US Open course that values straight driving, accurate iron play and exceptional putting. Wander only a bit off the fairway and disaster is a likely reward. This is what makes the US Open unique and fun to watch. Mental toughness and tenacity are rewarded where pars are a good score. US Open greens are faster than what the PGA pros are used to putt on. Lag putting is a premium and Oakmont's sloped greens made two putting a challenge. The best players in the world are great with putting distance control. Usually their first putts are within tap-in distance, but with the lightning speed and slopes of Oakmont a second putt of 5 feet was considered a good lag putt. Usually the winner of this championship would rank in the top five in putting, but not this year. Dustin Johnson won with exceptional ball-striking and at best average putting. His driving accuracy, when driving over 325 yards, was beyond belief. Make a small mistake at 250 yards and you probably will stay in the fairway, but make the same mistake at 325 yards and it will be deep in the rough. His precision was remarkable. Pundits have signaled this victory as possibly the start of an all-time great record and career. I do see one or possibly two more major titles for Dustin Johnson before his career is over, but his putting is not to the standard that is needed to be in that company. If his wedge game continues to improve and his putting makes a big jump, then we have a real contender to Jason Day, Jordan Spieth, and Rory McIlroy. Austin Johnson, Dustin's bother and caddy, stated that this was the best he had even seen Dustin hit the ball. This also points to an exceptional week where everything came together and it was his moment in time to win. Will this be the new norm as far as ball-striking or just a unique week? The USGA is standing firmly behind their ruling to assess a one shot penalty on Johnson when the ball moved on the fifth green. Dustin said he didn't make it move. My view of it on television was that there was no penalty. Rory McIlroy, Jordan Spieth, and Ricky Fowler all came out in defense of Dustin and called it a terrible ruling. Then the USGA caused more problems by informing all the contestants and the TV audience that there "maybe" was a rules infraction concerning Dustin Johnson. So for the last 90 minutes of a major championship, Dustin and everyone else were left with not knowing where he stood in relationship to the rest of the contenders. The USGA had made up their mind that there was an infraction, so they should have informed everyone of that decision. Earlier in the week, Charlie Hoffman called the USGA running of the tournament amateurish. I believe the USGA made an overreaching decision and compounded it by not assessing the one shot penalty when a decision was made. From there the communication was unclear and vague and that was amateurish. Fortunately Dustin Johnson won by a large margin to make the ball moving a moot point. But it did put a damper on an outstanding performance by a worthy champion.